Raith Rovers claimed a precious three points with a hard-fought 1-0 win over Alloa thanks to a stunning Callum Booth free kick at Recreation Park in their battle to beat the drop from the SPFL Championship. Rovers went with the same 11 that lost 3-2 at Hamilton on Tuesday, while the hosts made two changes to the side that lost to John McGlynn’s Livingston at Almondvale during the week, with Eddie Ferns dropping to the bench and Darryl Meggatt out of the Alloa squad altogether, with on-loan St. Johnstone man Liam Caddis and former Dunfermline striker Andy Kirk coming into the starting 11 for The Wasps. There was also a change in the home dugout since the last time the two sides met at Recreation Park back in November last year, with Barry Smith having taken over from Paul Hartley. The ex-Raith legend Hartley having moved to pastures new in Dundee. Alloa fashioned the first half-chance of the afternoon just two minutes in, with a crisp series of passing leading to right-back Michael Doyle swinging a cross in from out wide, which was comfortably taken by Lee Robinson in the Raith goal. Rovers created their first chance of the afternoon on eight minutes, but a somewhat ambitious 25 yard effort from Callum Booth going high and wide of Jamie Bain’s goal. Booth would try again from 25 yards later in the match with devastating results. The visitors then had another good chance with 13 minutes on the clock, the ball eventually breaking to Joe Cardle, however much like Callum Booth earlier, Cardle also sent his shot high and wide of the Alloa goal. Rovers had the ball in the net on 17 minutes, with Joe Cardle taking on an Alloa defender down the left wing before firing a cross into the box. Callum Elliot turned the ball into the net from inside the six yard box but the offside flag with raised correctly and the score remained 0-0, yet Rovers were starting out the far superior team. The first real flashpoint of the afternoon came on 22 minutes, when Darren Young launched into a nasty lunge on Grant Anderson right in front of the Rovers support in the gazebo. It was surprising given the nature of the tackle that the Alloa man received nothing more than a warning. The home side could, and perhaps should, have taken the lead 24 minutes in. Rovers failed to clear a corner and when the ball was turned back into the box an almighty stramash ensued in which Rovers failed to clear their lines, an Alloa player cracked a shot off the crossbar and then the home side claimed somewhat half-heartedly for a penalty. Incredibly, the game was still tied at 0-0. As the first half wore on, an ice cream van was heard playing a ludicrous jingle as it drove along Clackmannan Road. Ominously, the same thing happened in the previous Recreation Park meeting and Rovers went on to lose that game. Surely lightning couldn’t strike twice could it? It was with great relief to both sets of supporters that the half-time whistle was blown in a game where chances were at a relative premium. Both sides looked like teams scrapping for survival down in the lower echelons of the SPFL Championship, but Rovers were much the better side in the game and looked the more likely to score. Rovers broke the deadlock two minutes in to the second half. Grant Anderson, once again at his mercurial best at times in the game, was cynically taken out by Alloa sub Willie Robertson around 30 yards from goal. Callum Booth stepped up and sent an absolute pearler of a free kick right into the top corner past a stranded Jamie Bain. 1-0 to the visitors. Anderson and Robertson came together again eight minutes into the second period, with the Alloa man not quite so lucky this time. Robertson was booked for his troubles; it wouldn’t be unfair to say that Anderson had his opposite number on toast all afternoon. Callum Elliot and Grant Anderson wasted decent half-chances for Rovers but it was no exaggeration that Rovers were all over the home side and creating the majority of the chances in the game. How times had changed for Alloa since Paul Hartley’s departure. Alloa sent on Eddie Ferns for Darren Young in the hope of grabbing the equaliser, which could have came from a corner in 68 minutes but the ball in was taken easily by Lee Robinson. Rovers then brought on Kevin Moon in place of Fraser Mullin and Lewis Vaughan for Joe Cardle. 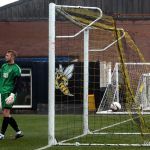 With time running out and Alloa seemingly running out of ideas, Jonathan Tiffoney tried an audacious attempt on goal with a direct free-kick from all of 40 yards; however the ball sailed over Lee Robinson’s crossbar. Rovers sent on Greig Spence in place of John Baird for the final five minutes of regulation time. Bairdy had put in his usual shift as ever. There were no further chances of note in the game and after four minutes of stoppage time referee Kevin Graham blew the final whistle on a scrappy game, but one where ultimately Rovers came out on top and with a goal of real quality to boot. For Alloa, their fight for survival takes them to the Bet Butler Stadium for a crucial Championship match against Dumbarton next weekend. Raith’s next outing is the small matter of the Ramsdens Cup Final against Rangers at Easter Road next Sunday. Rovers have already won one cup game at Easter Road this season; surely it can’t happen again… or can it. Robinson clears the ball straight to Kirk who can't capitalise. Mullen gets the ball over the wall but Bain gathers. Apologies for the break in commentary. Internet connection problems. ALLOA: Bain Doyle Gordon Lindsay Tiffoney Cawley McCord Holmes Young Caddis Kirk. Subs: Flannigan Robertson Caldwell Hynd McDowall Marr Fearns. RAITH: Robinson Thomson Watson Hall Booth Cardle Fox Mullen Anderson Elliot Baird. Subs: Moon Spence Callachan Donaldson Smith Laidlaw Vaughan. John Baird sends the ball into the Alloa box. A determined Cardle fires towards goal. Booth faces up to Doyle. 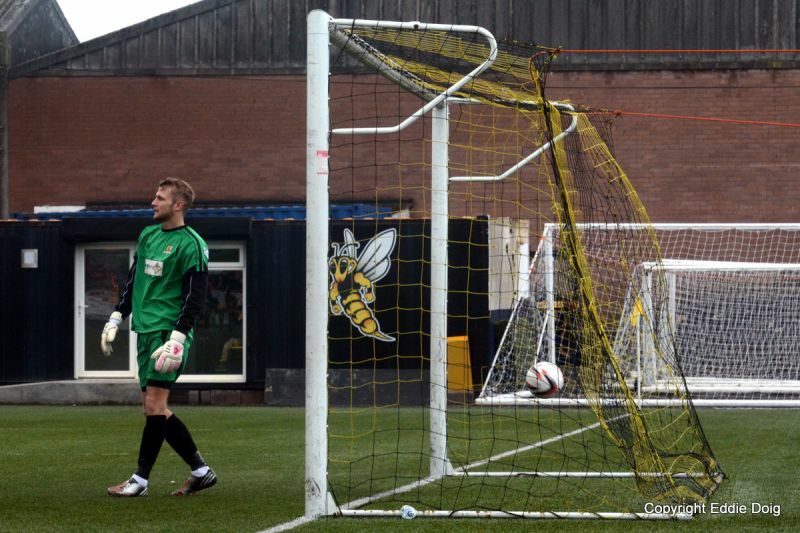 Action in the Alloa goalmouth. Cardle drives the ball past Gordon. Hill challenges Bain, foul given. Callum Booth fires from 25 yards out. Bain just manages to prevent Elliot from scoring. Anderson is barged off the ball and Lindsay gets to grips with Watson. Fraser Mullen fires a free kick into the Alloa box. Lindsay and Elliot in the Alloa box. A diving header by Calum Elliot. Dougie Hill crosses over Cawley to draw the foul late on. Elliot shields the ball from Holmes.